Why is my bearded dragon waving? Well that is a question I actually get a lot and I also see it often on the internet. Bearded dragons are really cool lizards and they get more and more popular. They are not only loved by reptile owners, now even people who are not really interested in reptiles think they are cute and maybe even think about getting one. However that could be a reason for the wrong information about the bearded dragon wave you can find all over the internet. You can find hundreds of videos where you can see bearded dragons wave their arms. Further you can find website which say that bearded dragons that wave, want to say Hello to their owner. To be honest, in my opinion this is a very cool idea. I mean wouldn´t it be great if your reptile would really grett you when you come into the room? I think all bearded dragon lovers agree here that this would be awesome. I am sure that a lot of dragon owners even say “Hello!” to their beardie just for fun when they see it wave. 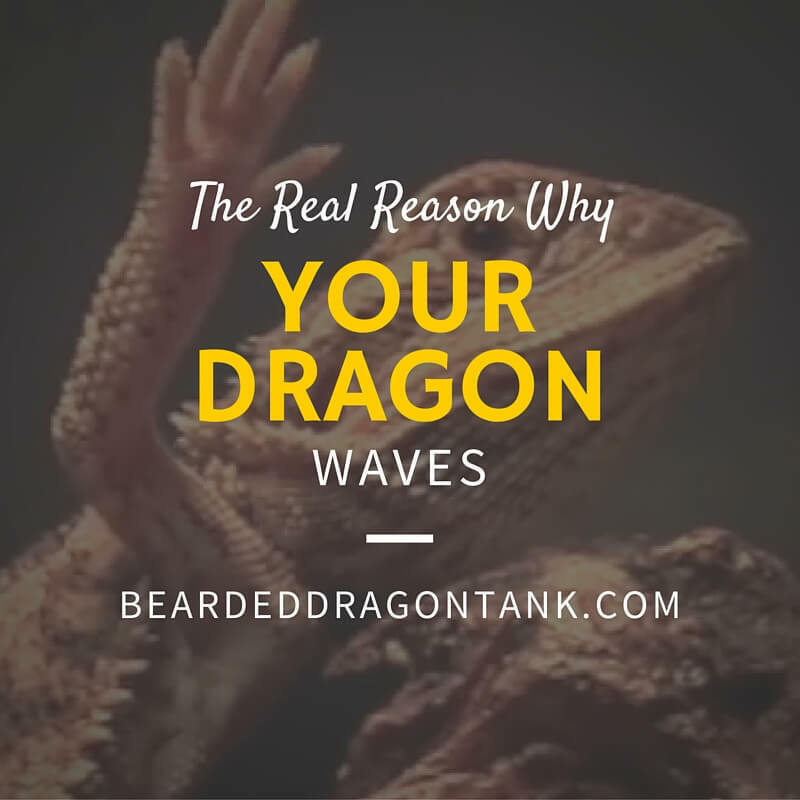 So before I start talking about the real reason why your bearded dragon waves, I want to make clear that not all owners see their dragons wave. That can have several reasons. The biggest reason might be the tank. If you do not have the right terrarium, right size, right lighting and so on and so forth, your bearded dragon might not show his full behavioral repertoire. 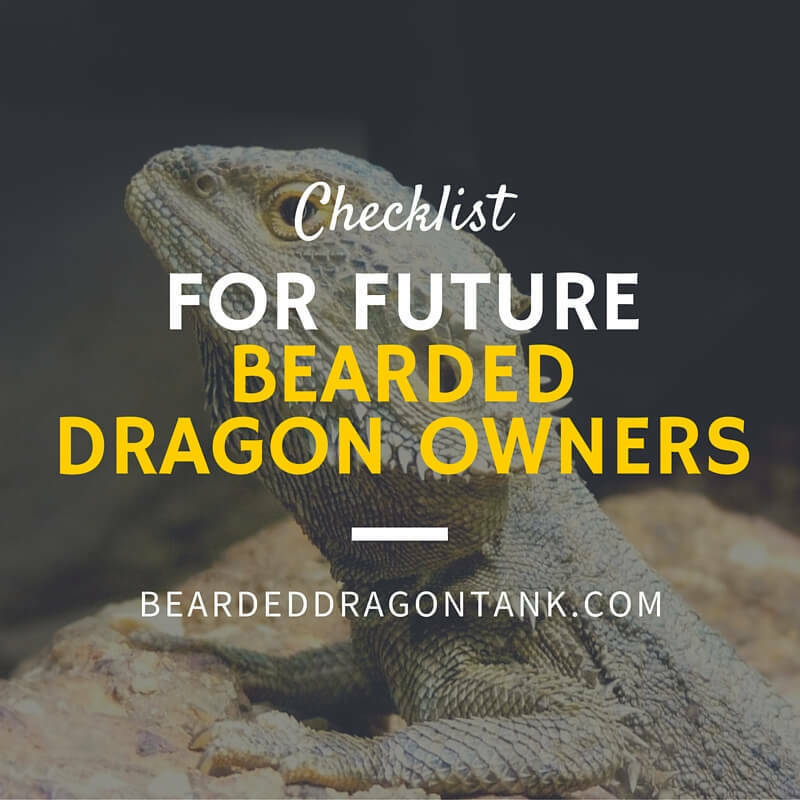 So make sure that you get a good tank for your bearded dragon. If you have problems with that, have a look the article below. It shows you how you can easily create a bearded dragon habitat on your budget. So now you know that it does not mean that your beardie is greeting you when you come into the room. In fact it means something totally different. It means that your beardie shows submission. The dragon accepts you or another beardie as the bigger dragon and he wants everybody to know that. However there are also beardie who wave without a reason. That might happen because the beardie sees his reflection in glass of his terrarium. Further scientists say that they are not completely sure if it also could have other reasons. I recently had a good chat on twitter. One of my followers asked me if her bearded dragon is a female and sent me a video of her beardie waving. So a lot of people think that only female bearded dragons are waving and the male bearded dragons bob their head as a sign of dominance. That is not true. No matter if your bearded dragon is a male or a female, both will wave and both will bob their head if they are in the right situations for that. So now that I made that clear, here is a video of a beardie waving his arms off. I know you want to see it lol! So I hope this answers your question: Why is my bearded dragon waving? Always make sure, that you get a good tank for your bearded dragon and that you feed it right! Tell me a story about your bearded dragon waving? When does it wave? I must admit that I always say hello when my beardie is waving at me lol. If you have any questions, simply leave your message in the comment section below and I will be more than happy to help you out! If you have a big bearded dragon and need to create a huge bearded dragon habitat, you will be very satisfied with the tank I compiled for you here. I know that it can be hard for beginners to get the right tank, the right tank size, the right lighting, the right substrate and so on and so forth. This terrarium is complete and it is ready for your bearded dragon to move in. So you do not have to do any further research, there is no need to get confused. I know it, because when I needed to create my first terrarium I was totally confused and made a lot of mistakes. Also I wasted a lot of money, because I bought the wrong parts or I bought low quality parts which did not do a good job. It might look small when you see it on a picture, but you will be amazed by how much space you have for your bearded dragon. 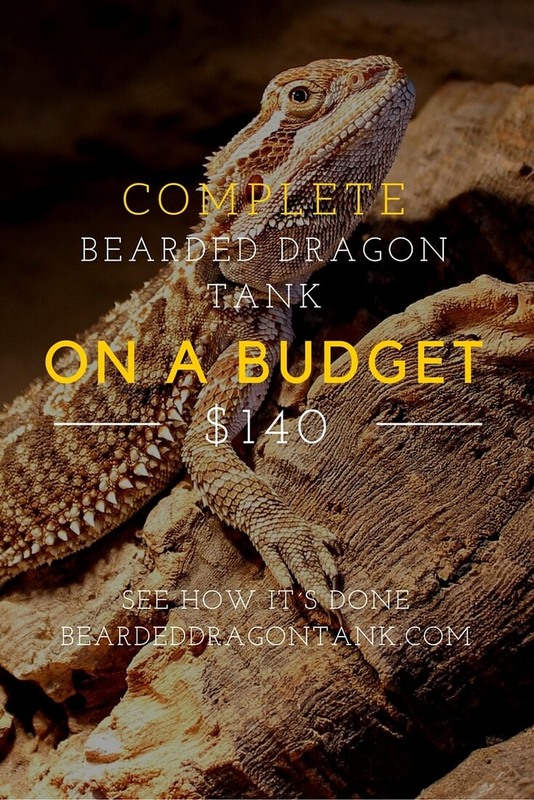 No matter if you have a baby bearded dragon or a huge adult bearded dragon, this tank is great for every size. 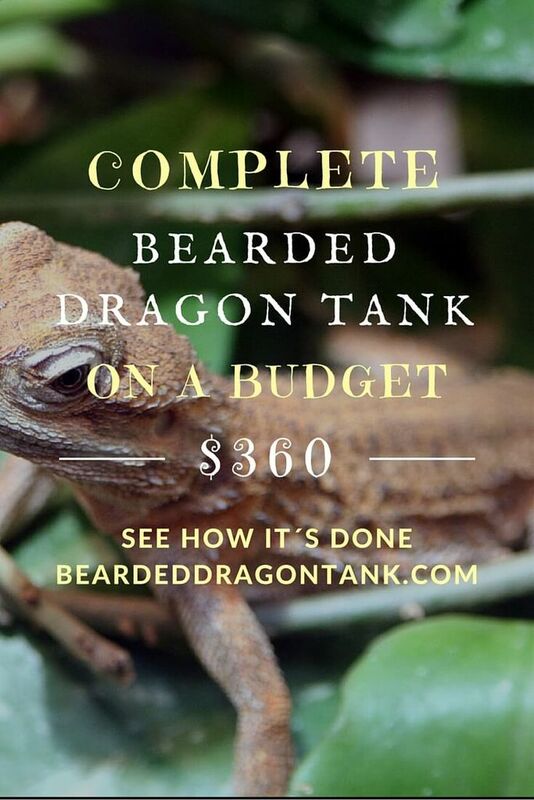 If you are one of those people who do not want to buy a tank over and over again, because your beardie gets bigger, then this is for you. This is the one for all tank, I mean we are talking about an 36 inch long tank here. The lighting is the most confusing part when it comes to terrariums and I totally understand that. 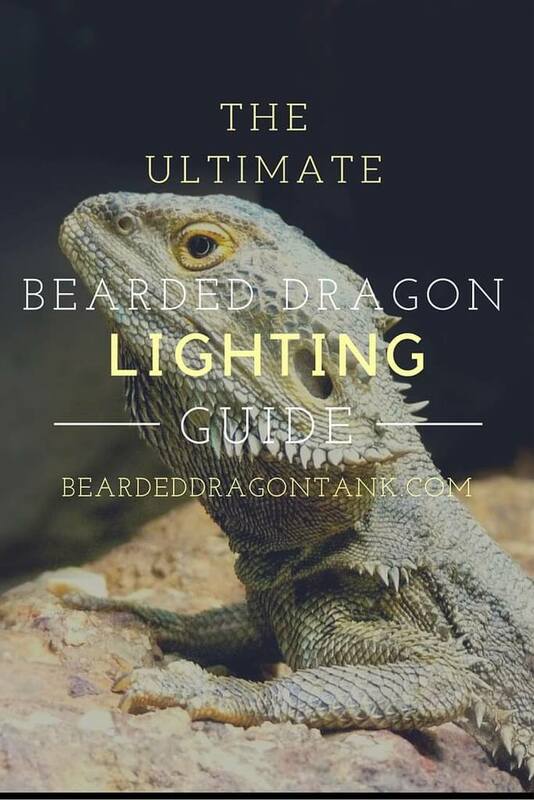 The UVB lighting I have here for you is one the best, I am sure that every experienced bearded dragon owner will agree with me here. I am sure you have been at a local pet shop before. Have you seen the prices there? It is ridiculous. If you order these parts online, you definitely will save a lot of money and I am sure that everyone who compared the online prices with the prices of a local pet shop will agree here. Further many salespersons (I am not saying all of them) at local pet shops provide a bad service and recommend parts which are low quality and even can have a negative influence on the health of your bearded dragons. This habitat only contains really high rated parts. You won´t have any problems with it, you only have to set it up once and that´s it. An Exo Terra Terrarium stands for high quality and so does this tank. It is 36 inches long, 18 inches deep and 18 inches wide. Yes you heard right, this is a huge tank. This Exo Terra Tank comes with a screencover, so you do not have to buy that separately. Just place your lights on the screencover and you are good to go, since the screencover allows UVB penetration. There is no need for a lamp stand or something like that. This tank also has front opening doors, which I think are really great. I like front opening doors, because it is easier to work in the terrarium plus it is better for your bearded dragon if you want to get it out. Why? Well, like all reptiles bearded dragons do not like to be grabbed from above. They might tolerate it, because most of them are pretty calm, but in the wild, everything that comes from above could be a predator bird for example and that means danger. The second reason why I really like these doors is because Exo Terra has a unique front window ventilation which ensures that your bearded dragon always gets enough fresh air. Fresh air gets trough the front window ventilation and stagnant air leaves through the screen cover on the top of the terrarium. Don´t worry feeder insects are not able to escape through the ventilation. Further the Exo Terra terrarium includes a natural-looking rock background. If you do not know it: Those backgrounds are normally ridiculously expensive. Normally those cost around $40 bucks or even more, which is a joke in my opinion. So it is great that this tank also includes the background. I am not the only person who thinks that this terrarium is great. This terrarium has 206 customer reviews on Amazon and it has a very high rating of 4.4 out of 5 Stars. As I already said, lighting is the hardest part in my opinion when it comes to reptile enclosures. You have to make sure that you have a UVB bulb, that you have enough light, the right temperature and so on. With this set you are on the safe side! I said it already a thousand times, but I have to say it again: The ReptiSun 10.0 is one of the best UVB bulbs out there in my opinion. This bulb is one of the most used and most recommended UVB bulbs. Many, many breeders and pet shops only use this bulb for UVB. You ask why? It has a great UVB output it is very reliable and it is cheap as well! Not even $20 for a great UVB bulb is an awesome price. UVB bulbs are needed to prevent metabolic bones disease, therefore you need a good UVB output. The ReptiSun is made for placing it on a screen cover, so you do not need to worry that the screen cover would filter out too much of the UVB wavelengths. It doesn´t! The bulb has a length of 24 inches and in my opinion this is perfect for the Exo Terra Tank above. Besides that the bulb also provides a good looking bright light which is very important for bearded dragons. The more light the better. You wanna know what the customer reviews on Amazon say? No problem! This product has 116 customer reviews and a rating of 4.7 out of 5 stars. So 81% of the customer reviews are 5 stars. That speaks for itself. Please note that UVB bulbs should be changed every six months since the UVB output decreases and that can cause mental health problems on your bearded dragon. You need a fixture for T8 bulbs if you buy the ReptiSun 10.0. This fixture was made for the ReptiSun. You can simply place it on the screen cover of your tank and that´s it. It also has a build-in reflector to make your tank shine bright and get the most out of your light. It also has a very positive rating on Amazon. It has a rating of 4.5 stars out of 5 stars. The heat lamp is nothing spectacular and this exactly is the point here. You do not need anything spectacular. You do not need any of the common reptile basking spot heat lights or something like that. If you already have the UVB bulb, all you need is warmth and additional light, that´s it. A normal incandescent light bulb will provide all you need. I do not use those basking lamps from common manufacturers even if they have a high rating on Amazon or other online stores. Most of those bulbs burn out within two weeks and besides that, they are totally overpriced, because they are advertised as special reptile bulbs. This normal incandescent 100W light bulb provides warmth and it provides a good looking white light. It is extremely cheap and comes in a 4-pack. Rating on Amazon? It has 303 customer reviews so far and 3.8 out of 5 stars. The Zoo Med Deluxe Porcelain Clamp Lamp is a high quality clamp lamp that comes with a porcelain socket. That means you can use it with light bulbs that get very hot. It is rated up to 150 watts. The light bulb does not stick out, so you can place it on the top of your screen cover without any problems. Further this clamp lamp is very cheap compared to other lighting fixtures. Not even $12 is an awesome deal. Of course this is another highly rated prodcut I have chosen. It has 200 customer reviews on Amazon and a rating of 4.1 out of 5 stars. You need a good thermometer to check the temperature in your bearded dragon cage. For that I recommend to use a thermometer with an external sensor for such a big tank. Simply place the sensor on the cool side first and after you checked that, place the sensor in the basking spot to make sure that you get the right temperature in your tank. Temperature is shown in Fahrenheit and Celsius and it has a LCD readout. Of course this thermometer has a very positive rating on Amazon (you probably guessed it, lol). It has 249 customer reviews and a very high rating of 4.2 stars out of 5 stars. There are also other thermometers I recommend, however it can be a little bit more expensive. If you are interested in that have a look at this article on terrarium lighting. Note: This article will open in a new window, so you can continue to read here! Many people, especially in the U.S. use reptile carpet as a substrate for their bearded dragons. You should not use loose sand as a substrate, because your bearded dragon might eat sand while hunting crickets. This can lead to constipation … a lot of bearded dragons die from that. That´s why most bearded dragon owners stay away from any loose substrate. The reptile carpet definitely does the job. It is easy to place in your tank and it is also easy to clean. It also reduces the smell of the beardie poop. Everyone who smelled a dragon poop before knows why this is a good thing. Most probably most people who smelled a beardie poop before lost their scent ..lol. I am just kidding. I recommend to wash the carpet before using it with hot water. So the reptile carpet is the inexpensive alternative to a normal bearded dragon substrate. However what exactly is a normal bearded dragon substrate? I like to keep it natural with my dragon tanks, that is why I normally use another substrate. If you are interested in that, you can read about it here: Substrate. Note: The article will open in a new window, so you can continue to read here after you are done with it. However do not get me wrong here, the reptile carpet is a good solution, otherwise I would not name it here, I just like to let my bearded dragons dig. I am not the only one who says that this reptile carpet is a great product. This product has 82 customer reviews on Amazon so far and a rating of 4.7 stars out of 5 stars. 79% of the ratings are 5 star ratings! You will need more, but it won´t cost you anything! Of course you need more for a complete tank, however you got the basics and your bearded dragon will do good in this terrarium. You have to decorate it with a few plants, rocks or pieces of wood, so your bearded dragon can climb and hide. I recommend to create a cave with stones on the cool side of the terrarium. This way your bearded dragon can escape from the heat if it wants to. Further you should create a basking spot, where your bearded dragon is able to relax in the “sun”. I do not recommend to use stones at the basking spot, those can get really hot and that can burn the skin of your dragon. So as you see, small stones or pieces of wood do not cost anything. You can take them from outside, but make sure, that you wash it before placing it in your tank. Do this before you get your bearded dragon! I highly recommend to check the terrarium before you get your bearded dragon. Make sure that everything is okay with the cage. Check the temperature, do you have the right temperature on both sides of the tank? I recommend to run the tank a couple of days before getting a beardie. This ways you do not have to deal with unexpected problems. Many people ask me: Pierre, why don´t you just buy a used tank, it is much cheaper. Yeah it is, but you have to disinfect it thouroughly. If the used tank is infected and you do not clean and disinfect it properly, your bearded dragon might get sick. That means going to the vet, which can be very expensive. It means my bearded dragons suffers, it means my bearded dragon might die. Happened to me once, I will never do this again. So this is why I only get new tanks. If you have any questions, or if you have any problems, please do not hesitate to contact me. Simply leave me a message in the comment section below and I will be more than happy to help you out! What do you think about this cage? Tell me about it in the comment section below! Do you have the right tank including lighting etc. ? If not you can find tanks on a budget here: Terrariums! Are you okay with crawlies? Bearded dragons eat insects and other crawlies. Do you know that your electricity costs will rise? The bearded dragon should not have missing toes or a missing tail tip. Adult bearded dragons need a lot of space, because you have to get a big tank for them. Further dragons should eat insects and other crawlies, I mean they also eat salad, but you have to feed them live food at least twice a week. Are you okay with that? In fact bearded dragons are loners and most of the times it is better to get only one dragon instead of two or even three. Two males will most probably fight as soon as they get older. However the same can also happen if you get two females, you never know. If that is the case, you have to separate them. Therefor you need two tanks, for two tanks, you need a lot of space. Do you have that space? If not, you should only get one beardie. Look for distortions, if it has a hunchback or something like that, do not buy it! You terrarium should already run and it should have the right temperature. If you do not have a terrarium have a look at this article. I compiled complete tanks for you which are ready for your bearded dragon. Simply choose your budget and get the complete terrarium. I hope that this bearded dragon info helped you and I hope that you get a healthy baby bearded dragon and have lots of fun with it. 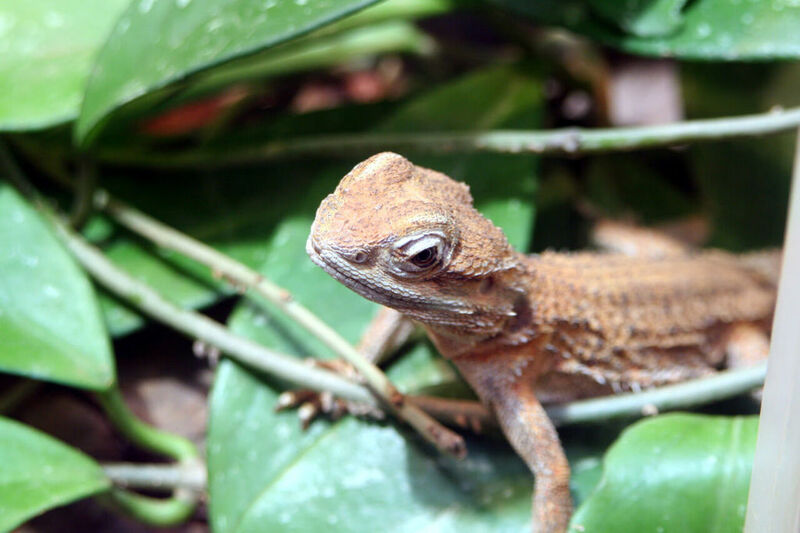 If you are a beginner when it comes to bearded dragons and you are looking for a cheap starter bearded dragon terrarium now, you should definitely check out what I have compiled here for you. I know that it can be quite hard to set up your first terrarium right, that is why I have done this for you. This terrarium is complete and ready for your baby bearded dragon. If you are interested in a complete terrarium for adult bearded dragons, click here! This terrarium is for people who want to get a baby bearded dragon and need a cheap first baby tank for their new friend. I know that a lot of people can´t immediately spend a lot of money on a bearded dragon tank, but want a bearded dragon really bad. Many of those people buy low quality tanks then and lose their dragon because of that. So if you want a dragon badly, but can´t afford a more expensive tank, don´t worry. This tank is absolutely fine for your baby bearded dragon and it will be great for the first months. This terrarium is pretty well put together and you are going to have no problems with this cage for your baby bearded dragon. The tank is an all-glass tank with a screened top. This is very important, because you have to put your lighting on the top of the cage and you want to prevent other animals from getting into the cage. Further you want to have a screened top for fresh air inside the tank. The tank measures 24 inches long by 12 inches wide and 16 inches tall. For a new reptile tank this 20 gallon tank is very cheap and has the right size for your baby bearded dragon. Further this all-glass tank has a very positive Amazon rating: 4.4 out of 5 stars. So you can´t do anything wrong with this tank. Especially for beginners setting up the right lighting for your bearded dragon cage can be very hard and that is where most beginners fail in the beginning. When I was a beginner I got a completely wrong lighting. However the lights I have chosen for you are definitely a great choice. The Zoo Med ReptiSun 10.0 is the best of the best when it comes to UVB bulbs. In fact most bearded dragon breeders and pet shops use this light, because it is just awesome. It has a high UVB output and this bulb is also recommended for use above the screencover. The screencover can filter out up to 50% of the UVB wavelenths, but for this bulb that´s no problem. You can find hundreds of positive reviews on Amazon of the Zoo Med ReptiSun 10.0. People think this bulb is phenomenal and a must have for reptile owner and I think the same here. Your bearded dragons will show their best natural behavior with this bulb and you won´have any problems regarding metabolic bone disease. The bulb also provides a good looking light. Light is very important for your bearded dragon, you do not want to have a tank which is almost dark. I really believe in this product and I am not the only one who thinks that this is the best UVB/UVA light. This bulb has 121 reviews on Amazon and a rating of 4.5 out of 5 stars speaks for itself. At the moment the Zoo Med ReptiSun costs around 20 bucks, which is a steal! There are a lot of more expensive UVB bulbs out there which do not provide a good light and are not nearly efficient as the Zoo Med ReptiSun. Further the ZooMed ReptiSun can also be used for bigger tanks. The UVB output of this bulb is high enough for that. Note: The UVB Output of such bulbs decrease over time. Make sure that you change the bulb every 6 months. The light fixture I recommend is more high quality then the light fixtures of the common manufacturers in the reptile scene. Besides that it is way cheaper than all the other light fixtures. $12 for this fixture is an awesome price. The fixture comes with a wired ungrounded plug and with a pre-installed bulb. Before you remove the pre-installed bulb, test the fixture first so you do not have to test it with your ReptiSun. The entire fixture is made of plastic, which is good, since it means that the fixture is light weight. You have to place the fixture on the screencover of your tank and you do not want to place a heavy fixture on it. Of course this product also has a lot of positive reviews on Amazon and a very high rating. It has 256 customer reviews and 4.2 out of 5 stars. This is another awesome product. If you do not want to do that, you can also use the fixture below. It is more expensive then the one I recommend, but it does the job as well! There is not really much to say about the heating bulb. You can´t really do anything wrong with this. It is a simple 100W incandescent bulb which provide warmth and a lot of light. You do not have to buy the expensive “reptile heating lamps”. This is just BS, most of the reptile heating lamps are really bad, they are expensive as hell, many of them burn out within two weeks and do not provide a good looking light. The light of the light bulb I recommend is white, which is very important in my opinion, since bearded dragons do not so well with other types of light. Further this is a 4-Pack, so if one burns out, you can use one of the three other bulbs which you have in reserve. If you want to set up a bigger tank when your bearded dragon gets bigger, you can simply use this bulb again, since the 100W bulb is great for any tank size. If it is too warm, hang the bulb a little higher above the tank. If the temperature is too low, simply raise the basking spot in your terrarium. The light bulb has 301 customer reviews on Amazon so far and it has 4 out of 5 stars. The fixture for the heat bulb has a porcelain socket. You can use heating bulbs up to 150W with it. I use this clamp lamp fixture for a very long time and I never had problems with it. This clamp lamp is the #1 Amazon Best Seller and has a very positive rating. It has 122 customer reviews and a rating of 4.1 out of 5 stars. The reptile carpet is made out of absorbent, non-abrasive material. Further it reduces the “reptile” smell. Everyone who smelled a bearded dragon poop knows, that it doesn´t smell like Chanel No. 5 so this is really good. Why carpet? Well, baby bearded dragon tend to lick on everything, since they want to explore the world. Besides that they get really quick and hectic when they see food. If you would use sand as a substrate in your tank, you baby might eat too much sand while hunting crickets. This can cause impaction and many reptiles die from that. Other people use newspaper or normal paper towel as a substrate. To be honest, I am not even the biggest fan of reptile carpet. I would never use paper towel or newspaper as a substrate. There is a difference between living and existing and I do not want my bearded dragons to only exist. The carpet itself is a very good product with a very high rating on Amazon. It has 189 customer reviews and a rating of 4.3 out of 5 stars. Further it is easy to clean. If it is dirty, simply rinse with water and reuse it. There is really not much to say about the thermometer. It definitely gets the job done and has a high ratingon Amazon. It has 130 customer reviews and a rating of 3.8 out of 5 stars. Make sure that you place it in your basking spot and in your colder area after that to see if the temperature in your tank is okay. Of course there are better thermometer than this one, but it is cheap and it works. For your first cheap bearded dragon tank, this is totally fine. If you want to see which thermometer I really recommend, have a look at this article: Bearded Dragon Lighting. This terrarium is ready for your baby bearded dragon to survive, but it is not really complete. Use stone or something like that to create a basking spot. Maybe create a few caverns with stone, for your baby, so it can hide. Make sure that those caverns are safe and do not collapse. Besides that the hiding place should be on the cold side of the terrarium so the bearded dragon can get away from the heat if it wants to. Maybe put in a few plants, which bearded dragons are allowed to eat. Use a few big wood sticks where your bearded dragons can climb and lie on. There are a lot of accessories for bearded dragons which you can buy, but for your first tank, you do not really need it. Use what you can find outside, wash it thoroughly with hot water. After it dried place it in your tank. Create a great home for your bearded dragon, do not just place it in the terrarium and watch it. Make sure it feels comfortable. It is a living being! You should place your tank in a more quite place. Bearded dragons can be very sensitive and especially in the beginning, they need time to get used to their new home. It won´t be good for the mental well-being of your beardie if you place the tank in a more “crowded” and loud place in your house. Please note that this is a tank for baby bearded dragons. When your dragon gets bigger, you need a bigger tank. A lot of people ask me why I do not buy used terrariums. Well I did that in the past. Once I bought a used terrarium and did not clean it correctly. My bearded dragon got sick, because the reptile that lived in it before had a disease. It was my fault, but I would never risk that again. You have to keep in mind that you do not only get a living being and you do not want it to die, because you love it, you also spent a lot of money for a bearded dragon. So that´s it, I am sure you will be very happy with this terrarium. I wish you a lot of fun with your bearded dragon. Always take good care of it! Do you have any questions about this bearded dragon terrarium? Simply leave a message in the comment section below. I will answer all of your questions and I always get back to my readers quickly. Get the right UVB Lighting! So here is the lighting I recommend for that plus the fixing, which you are also going to need. And I am not the only one who thinks that the Repti Sun is awesome. This product has 121 customer reviews on Amazon and it has a rating of 4.5 out of 5 stars. Do I need to say more? Besides that you need some very hot spots. Bearded dragons like to lie in the sun on huge stones. Especially in the morning, since they need to get the right body temperature. Those hot spots should have around 95°F – 105°F …yepp that´s hot! You do not have to buy very expensive reptile heat lamps for that. In fact normal heat lamp from the DIY market is okay. I recommend to go with 100W, but it depends on your tank size. You can also regulate the temperature by hanging the heat lamp a little higher above the tank. There are a lot of totally different opinions when it comes to substrate for dragons (and for many other desert dweller). Needless to say that the substrate should be similar to the ground in the natural habitat of the bearded dragons. The terrarium should contain a layer of substrate of about 7 inches. However you can form small hills here and there and have a little less substrate in some places of the cage. I think before I tell you what substrate I use, I should tell you what not to do. Why? Well, I have seen a lot of bearded dragon videos and videos of other reptiles on Youtube and I was shocked! I was shocked that so many people just buy a fish tank for their bearded dragon, put a few paper towels in there or even newspaper and that´s it. Why? There is no excuse for that. A lot of people say that bearded dragons might eat too much sand, if sand is used as a substrate, and die from that. Well first of all, that is not completely true. Baby bearded dragons tend to lick on everything, since they want to explore everything. It can happen that they eat sand while doing this and then they can become constipaded and die from that. Adult bearded dragons, however, do not lick on everything. There is no real danger for them if you do not use sand which is mixed with calcium. 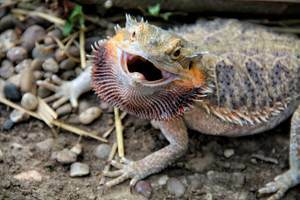 If it is mixed with calcium your beardie might eat to much of it and become constipaded. Secondly loose sand is also a very bad substrate. If you only use loose sand and do not give your dragon the possibility to get off the sand, it will cause damage to its joints over time. To be honest, I am not a fan of reptile carpet. Many people use carpet, because they are afraid that their bearded dragon could die from eating loose substrate. However a carpet is not natural. When it comes to my beardies I like to keep it natural. I want to create a natural habitat for them. Do you think there is carpet in the wild? Further you have to keep in mind that bearded dragons are passionate diggers. It is their normal behavior and with carpet, they can´t dig. Besides that their nails will get longer and longer if they do not have the possibility to dig. I only would use carpet for a quarantine tank, or for small beginner terrariums for baby bearded dragons which will be in use for only a few weeks. You can get carpet here at Amazon. Note: Click on the link to see how this product looks! This is the substrate I would go with. I used it several times and I never had problems with it. Bearded dragon can´t become constipated from eating substrate, since the clay gets hard. You can form hills and caves for your dragon. It is very close to a natural habitat. Bearded dragons love to dig, with this substrate they can even dig their own caves. Digging will make your beardie happy and your dragon will never have problems with long nails. No problems with damaged joints because of loose substrate. You can stick plastic plants and branches in this substrate before it dries. This way they will stick in the clay and can´t be knocked over. It will last longer then any other substrate. You can re-arrange it if you wet it down again. That means you always can create a new environment for your pet. Cheap and you most probably only have to buy it once, since you can re-arrange it. The substrate comes as sand. You have to mix this substrate with water, after that you can pour it in your terrarium, form ways, tunnels, caves and hills and let it dry. Please note that you will need a little bit more to form hills or something like that. I like to add a little bit of normal sand to the substrate, in my opinion it will be a little bit more loose when it dries. This way the dragons can continure to dig their own ways and caves. However other people who just use the clay say, that their reptiles were also able to extend their caves. So you do not have to mix it with a little bit of sand. Read the instructions on the package to know how much water you need. I like to add a little bit less water than recommended, because it was a little bit too watery for my liking. If you want to from caverns, you need something to hold the shape while it is drying. You can use normal balloons for that and pop them after the clay dried. I have tested the Cavern Kit for this substrate and for me it was really easy to create some great tunnels and caverns for my beardies. The cavern kit definitely helped me and it worked fine! However you don´t have to buy it. So I hope this article on bearded dragon substrate helped you. If you use paper towels or newspaper as substrate, please keep in mind, that bearded dragons are diggers. Even if your beardies are fine, there is a difference between only existing and living. What kind of substrate do you use and why? Would you suggest another substrate? If yes, why? Let´s discuss this in the comment section below, simply leave me your message and I will get back to you! If you have any questions, just leave a comment and I will be more than happy to help you out! Two-headed reptiles are not entirely uncommon. They probably happen more often than not. Stephen Evans of Birkenhead in the United Kingdom is lucky enough to have his pair of bearded dragons hatch out a two-headed beardie. Initially Evans thought that he had twins, but when it broke out if its shell he realized that the lizard was a conjoined twin. He posted a photo of the reptile onto his Facebook page and like most interesting images, it went mini viral in the social sphere. The bearded dragon, named Olaf appears to be like any normal bearded dragon, with the exception that it has two heads. Evans told the Liverpool Echo that it is healthy and strong and hatched out on its own with no assistance from him. The heads move independently and the rest of the lizard moves normally, he said.